The New Heads of State: Who's Afraid of The crooked i? Open since February 2010, The crooked i has welcomed folks of all kinds-- including you. DWNTWN- Usually when a bar shakes up a scene it is a flash in the pan. A distinct moment in time that passes like any other flying fancy and then there is a return to the status quo. The regulars return to their home bases. Hipsters here. Hippies there. Punks back here. Metal heads over there. It was the definition of the Erie music scene. The only crossover between bars was among musicians, perhaps going to see friends play, and the irreverent drunken Bacchanalia that leads you to places you wouldn't normally be found. 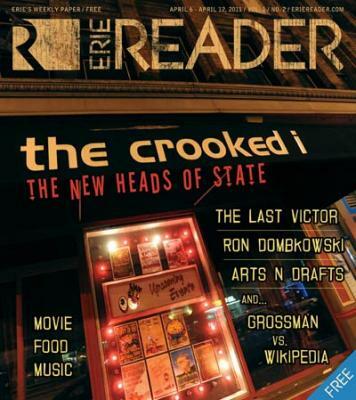 Then The crooked i opened in February 2010. It was instantly pegged as a scenester's place. All gaged-ears and neck tattoos. A corral for the freaks and poseurs. A place to wear your white fedora and not get laughed at. Except it wasn't. Erie just happens to have a demurely cool underground scene that catches on quicker than the populace. Some people were scared to go inside. Some people still are. But there was substance to be found in the bar. A place for people that can't, won't, or choose not to be classified for anything but their love of music and good times. And it shook up downtown. Booking great local and touring acts didn't hurt, but the bar itself has a distinct feel and tenor that invites souls to solace. Owned and operated by Marty Schwab, with a cadre of talent behind him, The crooked i has defied the laws of the scene and strives to bring everyone together for good times and better music. Or good music and better times, depending on your disposition. But Schwab didn't just blow into Erie and create a bar. Dues must be paid, teeth must be kicked, and every man must find his place. "I was sick of working for the man," Schwab says. "I was working for Valvoline, the evil empire oil company. They were moving me all over the country. I was living in Seattle, and I was trying to get back to the East Coast for family reasons and they wouldn't move me back to the East Coast so I basically told them to get [expletive deleted]." After he induced the company into self-copulation, Schwab took his savings and investments and found himself in Tampa, Fla.
"I took about six months off, never wore shoes. It was awesome," he says. "Just sort of pondering my next move in life. "I was walking in downtown St. Petersburg, and I saw a for sale sign on this venue called The Garage, and I was like, 'this is it, this is what I'm going to do.'" The Garage was not a bar, simply a music venue open for shows only. And it came with its own identity crisis. "I definitely had my challenges when I took that place over. It was a well-known Nazi-skinhead-metal-skinhead thing," he says. "I took my time, made the right connections just like… that's really what the music business is all about, meeting the right people at the right time." It was during a trip home in the summer of 2009 that Schwab, and girlfriend/event promotions director/rock-upon-which-he-would-build-his-church Tracy Evans, began birthing the idea of a bar. "Tracy is a force to be reckoned with. She is so influential in my decisions—I should say our decisions," Schwab says. "Tracy has her finger on what's cool. She knows what's cool. She sees it. She's got a great ear. "I couldn't pick a better life partner than her. Some days we look at each other like 'what the hell did we do?'" he says, laughing. "She is definitely the peanut butter to my jelly. The Cheech to my Chong. We think a lot alike. Which is really scary." "I came back to Falconer, N.Y. where my parents live," Schwab says, reminiscing. "Being an alum of Mercyhurst College, I wanted to show [Evans] our beautiful campus. [Later] we were down on State Street, middle of July, just asking, 'Where can we go to hear a good band?' There wasn't really anything going on. I just saw a glaring need for some original music in Downtown Erie. That's really what got the ball started rolling." Being from Falconer and attending Mercyhurst provided Schwab some background before choosing Erie. "I knew how the music was in Erie when I was here in the '90s," Schwab says. "You compare Erie's music scene to other large cities and you'd be surprised how much better Erie's music scene is than other cities that are a lot bigger, Tampa being one of them, in terms of local support and the like." Schwab and Evans began talking with realtors in the area looking for a place to buy. "At one point, I was seriously considering Scully's when I first came on to [the idea of opening a bar]," he says. The opportunity to buy the property at 1013 State Street became available as Nicky's Pub went up for sale. A bar with history—having been Nicky's, State Street Tavern, and Shooter's before that—but not Nazi-skinhead history.